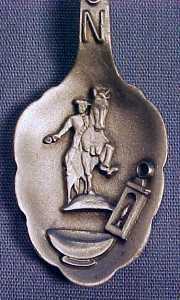 Vintage pewter figural souvenir collectible spoon from BOSTON featuring a high relief of the Paul Revere House by FORT. 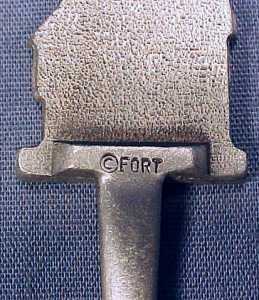 The dull silver colored pewter collectible souvenir demitasse spoon is in very good condition with no damage to note. The scalloped shell edge bowl of this spoon features a relief of Paul Revere astride a horse, a lantern and a bowl and the spoon handle features BOSTON. This vintage silver colored pewter souvenir collectible demitasse spoon with Paul Revere would be the perfect special silverware or flatware piece to use as a tea spoon, flavored coffee spoon, an espresso spoon, a cappuccino spoon and even as a hot chocolate spoon! 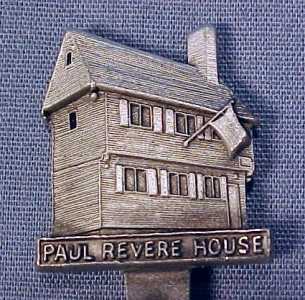 This flat silver colored pewter souvenir collectible spoon depicting the Paul Revere House in Boston measures 3.5" in length, weighs .6 ounces and is marked FORT on the back of the spoon.